If you want to make free calls form phone to phone all you have to do is to download a small application and install it in your phone. The application is called as fring and it is very useful for making free calls from one phone to another.Fring supports almost all types of mobile phones which are currently available in the market and also the other phones which have a java support and which can have internet connectivity in it. You can use fring to make video calls, live chat and etc. For this all you have to have is a good mobile which supports JAD files above 500bytes and also which can support internet connectivity on your phone. 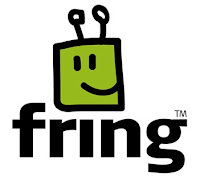 fring allows users to communicate with friends on popular networks over their mobile phone's internet connection and we can also connect to internet services like MSN, Gtalk, Yahoo, AIM, ICQ, Facebook, Twitter, all through one single integrated phone book. Now coming to the installation part of fringe..Its very easy to install the application and use it. 1) Just download the application from the below link. 2) Copy the application to your phone via data cable or by any other ways. 3) Open the application in the phone and install it somewhere. 4) Run the application and make unlimited calls. 5) Make sure the other phone is also having the application when you are using it.